On Saturday, December 8, the Bauer-Hillis Funeral Home in Rimersburg partnered with the Rimersburg Chamber of Commerce to host a Santa Social for the children in the community. Approximately 60 kids ages 12 and under attended the event and they had a wonderful time getting into the Christmas spirit! The children participated in four stations at the event: the reading of a Christmas story, taking a picture with Santa, decorating a picture frame and an ice cream social. The ice cream social was sponsored by the Bauer-Hillis Funeral Home and was the December ice cream social event for 100 Years of Giving Back, the funeral home's year-long centennial service milestone celebration. Deana Turner, manager of the Bauer-Hillis Funeral Home, Larry Bliss, funeral director, and Susan Carnathan, service associate, were on hand to assist with the festivities. Other volunteers from the chamber included Amanda Bliss and Niki Morganti, of Maple Grove Enterprises, Valerie Hile of Clarion County Community Bank, Lydi Montgomery and Nancy Carmichael of Klingensmith Drugs, and Brenda Haws of Haws Ricker Insurance Services. Pat Stewart, Susan Barger, Cindy Henry and numerous family members of the chamber members also helped with the event. Our staff would like to thank everyone for their help with the event — it was a great success! To see some pictures from the event, visit our Facebook page! On Thursday, December 6, the Bauer-Hillis Steps Ahead group traveled to Butler for an afternoon getaway and luncheon at Rose Haven Bed and Breakfast. The Proprietor, Debbie Carey, created an elegant dining experience and pampered her guests with gracious hospitality as she served each course of her homemade culinary creations. The luncheon was served in one of the two dining rooms. Each room of the home was beautifully decorated for the holidays and full of the family's collection of well-preserved antiques that included upscale furniture and glassware. After lunch everyone was given a tour of the home that was originally built in the 1800s and remodeled into today's five-bedroom home. Before leaving, each guest was presented with a lovely keepsake favor. The group will take a break during the winter, but the next event will be in March of 2013. Bauer-Hillis Steps Ahead offers a great way to stay connected with the community and anyone interested is welcome to join. For more information and to personally receive any future event announcements call the Bauer-Hillis Funeral Home at 724-756-2710 or 814-473-3080. The Bauer-Hillis Funeral Home in Petrolia is proud to present our bowling league! For the last five years our funeral home has sponsored the Bauer-Hillis Bowling Team that plays weekly at Bruin Bowling Lanes. The team members are Bob Fry, Bob Pennington, Ron Wulff, Mike Meissell, George Compton and Howard Barger. We are happy to support them and hope they have fun on the lanes! The Senior Choir of Grace Presbyterian Church will present their annual Christmas Cantata with two performances on Sunday, December 16, 2012, at 11 a.m. and 7 p.m. This year's cantata is titled "Lead Me Back to Bethlehem." The choir, accompanied by an instrumental ensemble, will present familiar tunes as well as folk songs to express the events and moods of that Christmas Eve so long ago. The choir is under the direction of Alice Young with piano accompanist Jean Ferrara. The performances are open to the public and a free-will offering will be collected at the evening performance. Come, let the choir lead you back to the miracle of the Christ Child's birth, the joy of shepherds, the mystery of the star and the men who followed it. Grace Presbyterian Church is located at the corner of Arch and North Jefferson Streets in Kittanning. On Sunday, December 2, Bauer Steps Ahead met at the Bauer Funeral Home in Kittanning for a special holiday luncheon that included quiche, fresh fruit, a cheese plate and cookies served in the family room. The room was decorated with antique radios, a wooden doll, WWII veteran's photo and other homemade decorations relevant to the theme of the play they attended. A special Christmas present to each attendee was having his or her picture taken in front of one of the funeral home's original fireplaces. After lunch, the group boarded the bus to travel to the Casino Theatre in Vandergrift where they attended the 17th Annual Hometown Christmas show, "Hope is Just Around the Corner". The musicians, choir and actors that brought this Christmas musical drama to stage were all local talent under the direction of Patti Albert. Set in 1941, the story portrayed the golden age of radio and the daily life of a family that struggled during the holiday season as they faced the brink of WWII along with the rest of the country. Throughout the performance, reenactments of 1940's radio big band era music, performed by a live orchestra and choir, and various nostalgic skits of the airways integrated into the story line. In addition, the historical radio broadcasts portrayed the country's fear of what was happening in the world at that time. The prevailing theme, "Hope is just around the corner," ran throughout the program. Everyone agreed the compilation of 1940's music mixed with the familiar Christmas favorites and story line touched their spirits and many shed a tear throughout the moving performance. Because the performance took the audience a step back in time, stories of some of the group members own experiences during 1941 were shared on the bus trip back home. The group will take a break during the winter, but the next event will be in March of 2013. Bauer Steps Ahead offers a great way to stay connected with the community and anyone interested is welcome to join. For more information and to personally receive any future event announcements call the Bauer Funeral Home at 724-545-9464. Read more about past excursions on the website or become a fan on Facebook. The Tree of Remembrance lighting service was held at 7 p.m. on Monday, December 3 at the Bauer-Hillis Funeral Home in Rimersburg. The trees held over 100 ornaments with the names of those who passed away in 2011 and 2012, as well as the names of loved ones that were requested by people in the community. Forty people attended the lighting ceremony, which featured a short message by Pastor Dan George and a cappella Christmas carols performed by the Union High School Choral Ensemble, directed by the music director, Mr. Gibson. Bauer-Hillis would also like to thank Myers Tire Service for donating the trees, Bob Ruffner's Industrial Arts class for making the ornaments and Michele Ballas' seventh grade art class for painting the ornaments. Families and friends were given the chance of honoring their loved ones by placing their ornaments on the tree. The trees will be up throughout the Christmas season, and anyone wanting to pay his or her respects is welcome to stop by. The Christmas season can be hard for those who have lost a loved one. To help local families honor the memory of their family members, the Bauer-Hillis Funeral Home in Rimersburg will put up a Tree of Remembrance during the month of December. The Tree of Remembrance will showcase ornaments with the names of those who passed during 2012. Anyone's name may be added to the tree. To request an ornament for a loved one, call the Bauer-Hillis Funeral Home at 814-473-3080 by Monday, December 3, 2012. To honor those lost throughout the year, a service will be held Monday, December 3, at 7 p.m. at the Bauer-Hillis Funeral Home. This short service will give family members and friends a chance to place their loved one's ornament on the tree, and a brief message will be delivered by a local pastor. Also, Christmas carols will be performed by an area group and light refreshments will be served following the ceremony. "The holidays are really tough for those who have lost loved ones, and we wanted to give residents a way to memorialize them during the Christmas season," said Deana Turner, manager and funeral director at Bauer-Hillis. "This is a wonderful way for those in the community to remember those who passed on throughout the year and can be healing for some." Union High School students helped make the ornaments for the Tree of Remembrance. Two students from the Industrial Arts class taught by Bob Ruffner cut the ornaments and they were painted by students from Michele Ballas' seventh grade Art class. An ad featuring all the names added to the Tree of Remembrance will run in the Wednesday, December 19 edition of the paper. The tree will stay up at the Bauer-Hillis Funeral Home until Wednesday, January 2, 2013; all ornaments need to be collected by that date. On Monday, November 19, 2012, the staff of the Bauer-Hillis Funeral Home in Rimersburg provided an ice cream social for the staff and residents of the Clarview Nursing and Rehabilitation Center in Sligo. The monthly ice cream socials are part of "Twelve Months of Giving Back", the year-long campaign develop to thank the entire Rimersburg community in celebration of the 100 year anniversary of the funeral home. Each month the funeral home chooses a different local business that has played an important role in the success of the community, and the Clarview Nursing and Rehabilitation Center definitely fits the bill. "Our staff works with the nursing home on a regular basis," said Deana R. Turner, manager and funeral director at Bauer-Hillis, "and I can say that they are compassionate committed to treating each resident and their families with the same standards that Bauer-Hillis finds important: quality, dignity and respect." Clarview Nursing and Rehabilitation Center is a 120-bed facility that offers full continuum of services and care to help each resident in the best way possible. Their dedicated health professionals provide careful assistance and quality care, personalized to meet the needs of each patient. Approximately 50 residents and staff enjoyed the ice cream, and afterward participated in a gospel sing-along. The nursing home provides many group events for those in their care. "My staff was glad to have the opportunity to serve the Clarview community" said Turner. "Caring for our local residents is a wonderful way to support our community, and we just want to thank them for their dedication." December's ice cream social will be the last one for "Twelve Years of Giving Back," so keep watching our website, www.bauerhillisfuneral.com, our Facebook page and local newspapers to see who is selected. On Thursday, December 6, you are invited to join Bauer-Hillis Steps Ahead for a memorable afternoon getaway at the Rosehaven Bed and Breakfast in Butler. Savor the culinary creations of Proprietor Debbie Carey as she creates an elegant dining experience, pampers her guests with gracious hospitality and rounds out the afternoon with a tour of her home. You will be served choices of gourmet coffee or tea, relishes, fruits, chocolates, homemade soup and scones, assorted gourmet sandwiches and assorted deserts, all served on her fine china collections. Well-preserved antiques are tastefully displayed and exceptional seasonal decorations add to the holiday ambiance. Before leaving, Debbie will present each guest with a lovely keepsake favor. We will meet at Bauer-Hillis Funeral Home in Rimersburg for bus transportation at 10:45 a.m. The cost is $35 and includes transportation, lunch and a tour of the bed and breakfast. Call Sandy at Bauer-Hillis Funeral Home at 814-473-3080 or 724-756-2710 by Monday, December 3 to make your reservation. Guests are welcome. The Bauer-Hillis Funeral Home in Petrolia, in conjunction with the Faith Community Churches and Clarion Forest VNA Hospice, will present "A Blue Christmas," a service of remembrance and strength during the holiday season. The program will be held Tuesday, December 4, 2012, at 7 p.m. at Faith Community Church, A Methodist Congregation, 145 Main St., Bruin. The Rev. Sue Evans, RN, BA, Bereavement Coordinator, the Rev. Randy Evans, Hospice Chaplain, and Debbie Lucas, MA, NCC, LPC, Bereavement Counselor, all of Clarion Forest VNA Hospice, will offer guidance on remembering loved ones and dealing with the sometimes overwhelming combination of grief and stress that can occur during the holidays. Also participating in the program will be the Rev. Wade Berkey and the Rev. Ali Fisher, of the Faith Community Churches. "It's about facing the reality that the holidays can be the toughest time of the year for some people," said Deana Turner, manager of Bauer-Hillis Funeral Home. "This service comes out of a need to fill a special niche during this holiday season; to help people find comfort and still share in the season, even though they may still carry a bit of sadness with them during the holidays." "Grief and loss touch everyone in their life at some time," said Rev. Wade Berkey of Faith Community Church. "Rev. Ali Fisher and I are so very grateful to be able to share in offering this program so that the healing process may begin for those grieving. If you are wondering if you should come to this program, the answer is probably yes!" The public is encouraged to attend this special holiday remembrance program, which will include the singing of songs, a brief inspirational message and a candle lighting ceremony. Light refreshments will be served following the program and an ornament will be reserved in memory of loved ones. Reservations are requested but not required and there is no admission fee. Please contact the staff at Bauer-Hillis Funeral Home at 724-756-2710 to advise us the number of guests who will be attending. On Sunday, December 2, join Bauer Steps Ahead for a matinee at the Casino Theatre in Vandergrift, to see their 17th Annual Hometown Christmas show, "Hope is Just Around the Corner." The show is a Christmas musical drama performed exclusively by local talent. Set in 1941, the story portrays the golden age of radio and a family's struggle of going through the holiday season with some family members absent due to a nation on the brink of WWII. Throughout the performance, reenactments of nostalgic radio broadcasts let the audience step back in time and experience the fear of what is happening in the world. Big band era music, performed by a live orchestra and choir, will integrate into the story line as it is broadcast over the family's radio. Original music mixed with familiar Christmas favorites form the backdrop for this memorable dramatic musical. The prevailing theme, "Hope is Just around the Corner," runs throughout the program. The group will meet at Bauer Funeral Home in Kittanning at 12 p.m. for a light snack and the bus will leave Kittanning at 12:45 p.m. The cost is $33 and includes a snack, bus transportation and show tickets. Reservations and money are due by Tuesday, November 27. Call Sandy at 724-545-9464 for questions and reservations. Guests are welcome. Bauer Steps Ahead offers a great way to stay connected with the community and anyone interested is welcome to join. Read more about past excursions on www.bauerfuneral.com or become a fan on Facebook. November is the month where our country honors our veterans for their service to our country. The Bauer-Hillis Funeral Home in Rimersburg said thanks to local veterans on Friday, November 9, with a breakfast at the Knight Spot Restaurant in Rimersburg. The veteran's breakfast was the November event for "Twelve Months of Giving Back", the funeral home's year-long celebration of the centennial service milestone for Bauer-Hillis Funeral Home. "Our veterans have done so much for our country and our local community," said Deana R. Turner, manager of the Bauer-Hillis Funeral Home in Rimersburg. "They are essential to the success of our business throughout the last 100 years, and we wanted to show them how much their service is appreciated." Turner, along with funeral directors Jack Bauer and Larry Bliss, service associates, Dan George and Susan Carnathan, and community relations manager, Sandy Mikita, attended the breakfast and helped serve food. The funeral home staff then presented American Legion Post 454 and VFW Post 7132 with a donation of $100 for their organization. Each veteran in attendance was also presented with a flag lapel pin and the funeral home is ordering them each a tie tack from their respective military branch. "Our staff often works with the local veterans and we are so thankful of all they do for not only us, but for the community," said Turner. "I am proud to work with a group of men so dedicated to serving our country and our town." The last activity for "Twelve Months of Giving Back" will be in December 2012. To find out about our monthly events, visit www.bauerhillisfuneral.com, watch the local newspapers or call 814-473-3080. To see pictures of the breakfast, visit our Facebook page! Photo: Deana Turner, manager and funeral director at Bauer-Hillis Funeral Home, presents Terry Custer and Larry Murray, presidents of American Legion Post 454 and VFW post 7132 of Rimersburg, with a $100 check. The donation is the November part of "Twelve Months of Giving Back," the funeral home's centennial service milestone celebration. On Friday evening, November 2, 2012, Bauer-Bly Funeral Home was one of the 30 venders that participated at the Dayton Elementary School's Fall Festival. Community Relations Manager, Sandy Mikita, and Service Associate, Bobbi Ruth Blinn, were on hand representing the funeral home during the event and promoted the importance of bike safety. Mikta had handouts and fun activities that explained safety rules to the elementary students, and the funeral home also sponsored a free raffle that gave away two youth bicycle helmets. Landon Stockdale was the winner of the boy's helmet and Melody Burrell was the winner of the girl's helmet. The exhibit also gave visitors an insight into what all the funeral home does in the Dayton community. A power point presentation was set up that explained the Bauer Steps Ahead outreach program, and flyers were handed out announcing "Surviving the Season," the holiday grief program scheduled for Wednesday, November 14, at the Bauer Funeral Home in Kittanning. Mikita also made available to festival-goers information about cemetery monuments. "Bobbi Ruth and I had a wonderful time at the festival," said Mikita. "We were glad to provide fun activities for the children and also share information about our outreach programs with local residents." We enjoyed doing our part to help the Dayton community and will be ready to continue our efforts in Spring 2013. Bauer Steps Ahead enjoyed seeing the panoramic fall colors as they traveled to tour the DeBence Antique Music World Museum in Franklin on Tuesday, October 16. Upon arrival, a buffet style lunch was served in the event center at the museum before the tour began. A personal guide introduced the group to a number of beautifully crafted mechanical rare music boxes, player pianos, merry-go-round and Wurlitzer band organs, Nickelodeons and Calliopes. Everyone was fascinated that the music spanned from gentle to loud big-band music. Over 100 old-time mechanical musical instruments, over 40 Tiffany-style lighting and a wide range of antiques were shown during the tour. Before leaving Franklin, the group had extra time to shop at the museum's gift shop and the unique businesses nearby. During the month of November there will be no outing; instead the group is invited to participate in the annual Holiday Grief Program: "Surviving the Season", on Wednesday, Nov. 14, 2012 at 7 PM at the Bauer Funeral Home. This free event is open to anyone in the community who has lost a loved one and is looking for guidance over the holiday season. Jenna Rhodaberger, MSW, LSW, Bereavement Coordinator and Medical Social Worker of VNA Hospice and Palliative Care will be the speaker. The next outing will be Sunday, December 2, 2012 when attendees will travel to the Casino Theatre in Vandergrift to see a production of the theatre's 17th Hometown Christmas with the theme of "Hope is Just Around the Corner". Complete information about the trip is forthcoming. Bauer Steps Ahead offers a way to stay connected with the community and anyone interested is welcome. For information, schedule and cost of future events, call Bauer Funeral Home at 724-545-9464. Read more about past excursions at www.bauerfuneral.com and visit our Facebook page to pictures of October's trip. The Bauer-Hillis Funeral Home will host a free Holiday Remembrance Program entitled, "Holiday Grief: Surviving the Season." This very special presentation will be held on Wednesday, November 7, 2012 at 7:00 PM at the Bauer-Hillis Funeral Home, 758 Main Street in Rimersburg. The public is encouraged to attend this special holiday remembrance and bereavement support program. Reservations are requested but not required and there is no admission fee. Light refreshment will be served following the program. Please contact the staff at Bauer-Hillis Funeral Home at 814-473-3080 to advise us the number of guests who will be attending. The Bauer Family Funeral Homes will host a free Holiday Remembrance Program entitled, "Holiday Grief: Surviving the Season." This very special presentation will be held on Wednesday, November 14, 2012 at 7:00 PM at the Bauer Funeral Home, 515 North McKean Street in Kittanning. The public is encouraged to attend this special holiday remembrance and bereavement support program. Reservations are requested but not required and there is no admission fee. Light refreshments will be served following the program. Please contact the staff at Bauer Family Funeral Homes at 724-545-9464 to advise us the number of guests who will be attending. Jennifer Bauer Eroh was among the many funeral service professionals attending the 94th Annual Meeting of Selected Independent Funeral Homes in Boston, MA, September 19-22. Eroh is the president of Bauer Funeral Home and Cremation Services, Inc. in Kittanning with branches in Elderton, Dayton, Petrolia and Rimersburg, PA.
"I always value the opportunity to gain new information and insight on how to better serve my client families" said Eroh. "Selected's meeting provided valuable opportunities to gather with my fellow members of Selected Independent Funeral Homes from across North America and around the world. We participated in a variety of informative study sessions, discussed insights and shared new ideas that I'm excited to implement." Meeting sessions focused on important issues concerning the funeral service profession such as innovative service ideas, timely business advice and best practices. Among the many topics covered during the meeting were working with today's media, creating a solid business, building relationships with clergy and helping adults better assist grieving children. Founded in 1917 as National Selected Morticians, Selected Independent Funeral Homes (www.selectedfuneralhomes.org) is the world's oldest and largest association of independently owned funeral homes. Members of the association are expected to operate according to strict standards and best practices in order to provide the public with reliable, high-quality funeral services and funeral-related information. "Our members pledge to uphold the Selected Independent Funeral Homes Code of Good Funeral Practice and are committed to the important responsibility they have to the families and communities they serve," said Robert J. Paterkiewicz, Executive Director of Selected Independent Funeral Homes. "It's a tradition of trust that Bauer Funeral Home has been a part of for 48 years." Despite the gloomy and chilly weather, Bauer-Hillis Funeral Home and other Petrolia organizations came together to help raise money for new playground equipment at Petrolia Community Park. Lead by Cinda Six, owner of Boltz's Convenience Store in Petrolia, the yard sale consisted of six tables full of merchandise donated by local residents and businesses. Calumet (formerly Witco) donated the tables and Larry Bliss, funeral director at Bauer-Hillis, helped supervise the Bauer-Hillis tables. More than 50 people stopped by and $50 was donated to the park fund by the Bauer-Hillis staff, with more added from the other local groups. To earn additional funds, the groups will have a second sale in the spring. "Bauer-Hillis is dedicated to Petrolia and the surrounding communities, and we are pleased to be a part of the effort to raise money for the park," said Deana Turner, manager and funeral director at Bauer-Hillis. "The playground equipment will be a great addition to the park and we hope to have an even better turn out for the spring sale." The Third Annual Don Miller Memorial Truck Show was held in conjunction with the Apple Butter Festival in Elderton on Saturday, October 6, 2012, and Clark Chapel of the Bauer Funeral Home enjoyed celebrating this event with the community. This yearly event celebrates the life of Don Miller, who was an outstanding business owner and resident of Elderton when a tragic accident on April 23, 2010 took his life. Elderton's Main Street was filled with 15 big rig trucks, some from local towns and others from miles away, all to help raise money for the Relay for Life "Lifesaver" team, a cause that was important to Don. The show is truly a family event. Patty Miller, Don's wife, and Brice Miller, the son of Don and Patty and a 6th grader at Elderton Elementary School, donated eight trophies that were awarded to the truckers for wins in various categories, and Brice also displayed his collection of model big rig trucks during the show. Nick Clawson, the stepson of Don Miller, always helps organize and notify all the truckers participating in the show, and Jackie Shaw, Charlene Miller and Patty Miller manned the registration table and set up the Chinese auction items. Clark Chapel Funeral Home is proud to assist the Miller family during the truck show each year. Sandy Mikita, community relations manager, was on hand to provide the registration area on the front porch of the funeral home and give away a wagon full of pumpkins. The funeral home also hired DJs Doug and Kathy Lucas to entertain everyone during the show. Other activities during the truck show included a Chinese auction with more than $1,000 worth of items placed in 10 baskets. Deb's Chome Shop in Connellsville, J.C.T. Trucking and Bachman Trucking donated the baskets for the auction. The truck show organizers were very happy to add over $400 to the Relay for Life "Lifesaver" fund. On Thursday, October 4, 2012, Bauer-Bly Funeral Home staff members, Jack Bauer, funeral director, Sandy Mikita, community relations manager, and Bobbi Ruth Blinn and Frank Soloski, funeral service associates, were four of the many who volunteered their time at the Dayton Volunteer Fire Department's Thresherman's Dinner. The semi-annual fundraising dinner and the nice weather brought hundreds of local people out to support the Dayton Fire Hall's fundraising efforts. "It takes many volunteers to prepare, serve and clean-up for a full day of activities," said Bauer. "We were glad to help out the Dayton Fire Department and we all had a great time serving dinner to the community." On Sunday, September 23, 2012, Bauer Steps Ahead traveled to Gibsonia to see a matinee performance of "Born Yesterday" at the Kean Theatre of the St. Barnabas complex. The comedy "Born Yesterday" is one of the most successful and longest running Broadway plays and was performed by semi-professionals from the area who did a wonderful job. The play followed the politics of a successful but corrupt businessman who brings his not-so-bright girlfriend to Washington DC and hires a journalist to educate her. Through her education she realizes her boyfriend isn't such a gentleman and plots to thwart his shady dealings. A delicious hot buffet lunch was served in the beautiful Mt. Vernon dining room prior to the matinee. On Tuesday, October 16, 2012, the group will travel to the DeBence Antique Music World Museum in Franklin, PA. The museum houses an incredible rare collection of more than 100 beautiful antique mechanical and automatic musical instruments, machines and music boxes that spans two centuries. The collection is showcased by a wide range of antiques that have either musical or local significance, and the lighting is provided by over 40 Tiffany-style hanging lamps. A catered buffet luncheon will also be served in the museum's event room prior to the tour. The cost for the event is $47 and includes bus transportation, a guided tour and lunch. Attendees will meet at the Bauer Funeral Home in Kittanning at 9 a.m. Reservations are due by Tuesday, October 9, 2012 and as always, guests are welcome. For questions or to make a reservation, call Sandy at 724-545-9464. On Tuesday, October 16, 2012, join Bauer Steps Ahead for a fall foliage tour as they journey to Franklin, PA to visit the DeBence Antique Music World Museum, which houses an incredible rare collection of more than 100 beautiful antique mechanical and automatic musical instruments, machines and music boxes that spans two centuries. The collection is showcased by a wide range of antiques that have either musical or local significance and we will see and hear many of these mechanical marvels deliver their music of yesterday. Also, the lighting in the museum is provided by over 40 Tiffany-style hanging lamps. A catered buffet luncheon including chicken salad croissants and ham and cheddar croissants, roasted red skin potatoes, salad, yam souffl�, homemade chocolate chip and iced sugar cookies, ice tea and lemonade will be served in the museum's event room. Meet at Bauer Funeral Home in Kittanning at 9 AM. The cost is $47 and includes bus transportation, a guided tour and lunch. Call Sandy at 724-545-9464 for questions or to make reservations due by Tuesday, October 9. Guests are welcome. On Monday, October 8, 2012, join Bauer-Hillis Steps Ahead for a fall foliage tour of Clarion, Jefferson, Clearfield and Elk counties on the way to the Elk Country Visitors Center in Benezette, PA. The Visitors Center features state-of-the-art interpretive and interactive exhibits designed to educate visitors about the history, ecology and behavior of the elk population, and also natural wildlife conservation and green building design. A 30 minute film that showcases the seasonal activities and conservation of the elk will be shown in the 4D Immersive Theatre, which features multimedia sights, sounds and sensory experiences. Another highlight of the center is the Great Room, which houses an indoor observation area with panoramic windows, a cozy fireplace, hands-on exhibits and a diorama that illustrates elk and other wildlife. You can also visit the gift shop, and throughout the day you may even see the magnificent elk along the road or the forest. Lunch will be served at the center and includes a club or tuna melt sandwich, vegetable soup, dessert and beverage. Meet at the Bauer-Hillis Funeral Home, Rimersburg for bus transportation at 8 a.m. The cost is $41 for bus transportation, lunch, guided tour and theatre ticket. Reservations are due by Monday, October 1, 2012. Please call Sandy at 814-473-3080 or 724-756-2710 for reservations and questions. Guests are welcome. Senator Don White, Representative Jeff Pyle and Representative Donna Oberlander hosted the 2012 Senior Expo on Wednesday, August 29 from 10 a.m. to 1 p.m. Over 325 seniors from across Armstrong County attended the Expo that was held at St. Mary Parish Hall in Kittanning. Funeral Director Jack Bauer and the Bauer Funeral Home staff were pleased to see all who stopped to visit at our exhibit at the Expo. Questions and concerns about pre-planning funerals, cremation options and traditional funeral options were directed to the funeral directors. Sandy Mikita, community relations manager, and Bobbi Ruth Blinn, service associate, were also on hand to offer information on cemetery grave markers, bereavement information and the Bauer Steps Ahead outreach program. Visitors also signed up for door prizes at the Bauer Funeral Home exhibit. Two beautiful autumn floral arrangements donated by Kimberly's Floral and Design of Kittanning and Darlene's Flower and Gift Shop of Elderton were awarded to winners. In addition, the funeral home also had two other door prizes of $20 gift certificates to Dizzy Lizzy's Restaurant. On Wednesday, August 29, 2012, the staff of the Bauer-Hillis Funeral Home in Rimersburg thanked the staff of the Leader Vindicator and District Judge Jeffrey Miller with an ice cream social. The monthly ice cream socials are part of "Twelve Months of Giving Back", the year-long campaign develop to thank the entire Rimersburg community in celebration of the 100 year anniversary of the funeral home. Each month the funeral home chooses a different local business that has played an important role in the success of the community and the funeral home, and the newspaper and district judge's office have been an important part of the local heritage. "Our staff is constantly in contact with the employees at the Leader Vindicator for a number of things, including placing obits, running ads and sending stories about our involvement with local events," said Deana R. Turner, manager and funeral director at Bauer-Hillis. "We also invited District Judge Jeffrey Miller because we have worked with him through many events in the community and know how much his office does." The Leader Vindicator has been a fixture in the community for over 130 years. Originally called the Leader, it merged with the Rimersburg Record in 1970 and became the Leader Vindicator. The paper is published every Wednesday and over 4,000 households currently hold subscriptions. Despite being up since 4 a.m. putting together the Wednesday edition of the paper, the staff enjoyed the ice cream and saw it as a sweet end to a stressful morning. Judge Miller presides over judicial matters pertaining to southern Clarion County and has held the district judge position since 2007, taking over for retired judge and current Bauer service associate, Dan George. "We are glad the newspaper staff and the judge's office enjoyed their treat," said Turner. "They do so much for the area and we are just happy to show them appreciation not only on behalf of our staff, but the community as a whole." Want to know September's recipient of the ice cream social? Keep watching our website, www.bauerhillisfuneral.com, our Facebook page and local newspapers to see who is selected next�the announcement could come at any time! Photo Caption: Service Associate, Dan George, serves LV General Manager, Ryan Wells. Despite the rain and cooler temperatures, the Bauer-Hillis Funeral Home staff provided a variety of entertainment for the Rimersburg community during the Cookie Daze Festival that was held August 10-12. "We had a wonderful time meeting the residents of the area and watching them enjoy the various events," said Deana R. Turner, manager and funeral director at Bauer-Hillis Funeral Home. "Throughout the weekend our family-friendly activities were a hit with visitors and we are glad they had a great time." Festivities kicked off during the Cookie Daze parade on Friday evening with the Bauer-Hillis Funeral Home featuring a horse-drawn hearse in front of a float carrying Bauer-Hillis staff and their families who tossed candy to parade watchers. Since the festival had a Civil War theme, the funeral home worked in conjunction with the Veteran's Museum to reenact a period funeral from the Civil War era. The hearse carried a wooden coffin and Larry Bliss, funeral director, accompanied the procession as an undertaker from the 1860s. When the parade procession reached the end of the route, the funeral service commenced for Jeremiah Zachariah Brown, a Clarion County Civil War veteran, at Veterans Park. Pastor Dan George, Bauer-Hillis service associate, officiated the funeral service and was happy to honor the memory of the veteran from Porter Twp. After the funeral service, pony rides were available for children in the Bauer-Hillis parking lot. Five ponies on a wheel took youngsters around in a circle. Squeals of delight could be heard around Rimersburg as more than one hundred children partook in the amusement. The Power Wheel Races took place on Saturday morning with registration and lineup in the Bauer-Hillis parking lot, and despite the chilly temperatures, this year's race drew a large turnout. Throughout the weekend a period tent was set up in Veterans Park that showcased funeral antiques used throughout the last century. Bauer-Hillis funeral director Larry Bliss manned the tent to answer questions from the many inquisitive visitors. Items on display included embalming jars, an embalming table, a wicker basket used for removing the deceased and ancillary equipment used to show deceased persons in their homes. The Cookie Daze Car Cruise was on Sunday and many people enjoyed looking at the hundreds of classic cars amidst the DJ music provided by the funeral home. Even as the cars departed the festivities, spectators were entertained with spinning tires and smoke as the cars departed with classic burnouts. In the evening, the Bauer-Hillis Funeral Home provided a fun family movie night and featured the movie "Dolphin Tale". Over 100 community residents turned out for the show and had a great time watching the flick in the funeral home's parking lot on a large blow-up screen. The Jerusalem United Church of Christ sold drinks and popcorn, Friends of the Library sold chocolate bars and the Union Youth Football Boosters sold Homemade Cookies. "Our staff is so happy that we were able to provide community residents and visitors with all these fun opportunities throughout the festival," said Turner. 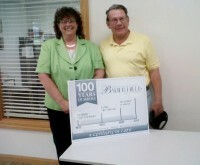 "It was the perfect opportunity for us to continue our anniversary celebration of 100 years of service to Rimersburg. Everyone had a great time and we look forward to next year's festivities." Senator Don White, Representative Jeff Pyle and Representative Donna Oberlander will be hosting the 2012 Senior Expo on Wednesday, August 29, from 10 AM — 1 PM at St. Mary's Parish Hall, 351 N. Jefferson Street, Kittanning, PA. The Bauer Family Funeral Homes professional and friendly staff will be present to offer information about pre-planning funerals, cremation options, traditional funeral options, monuments and bereavement information. We will also have brochures and other literature available that will help seniors make educated decisions on these topics. Several other door prizes will also be available when signing up at the Bauer exhibit. These will include two beautiful autumn floral arrangements donated by Kimberly's Floral and Design of Kittanning and Darlene's Flower and Gift Shop of Elderton. On Sunday, September 23, 2012, join Bauer Steps Ahead as we visit the Kean Theatre at St. Barnabus in Gibsonia to see a matinee performance of one of the most successful and longest running Broadway plays, "Born Yesterday" by Garson Kanin. This comedy follows the politics of a successful but corrupt businessman who brings his not-so-bright girlfriend to Washington DC and hires a journalist to educate her. Through her education she realizes her boyfriend isn't such a gentleman and plots to thwart his shady dealings. A buffet lunch including salad, broccoli stuffed chicken breast, baked cod, penne marinara, rice pilaf, green beans, glazed carrots, assorted desserts and beverages will be served in the Mt. Vernon dining room prior to the matinee. Meet at the Bauer Funeral Home in Kittanning for bus transportation at 10:15 a.m. Lunch will be served at 12:30 p.m. followed by the matinee at 2 p.m. The cost is $58 for bus transportation, lunch and the show ticket. Money and reservations are due by Monday, September 10, 2012. Please call Sandy at 724-545-9464 for reservations and questions. Guests are welcome. Bauer Steps Ahead offers a great way to stay connected with the community and anyone interested is welcome to join. For more information about the group and to make reservations for future events, please call the Bauer Funeral Home at 724-545-9464. Read more about past excursions on www.bauerfuneral.com or become a fan on Facebook. On Monday, August 6, 2012, Bauer Steps Ahead traveled to Pittsburgh for a "Vegas Getaway" aboard the Gateway Clipper Fleet's Princess riverboat. As the cruise on the three rivers got underway, a narrator pointed out highlights of Pittsburgh and its local history prior to a delicious hot buffet lunch. After lunch, everyone enjoyed Bo Wagner's "Frank and Dean Revue" an exciting live tribute that paid homage to Rat Pack musicians Frank Sinatra and Dean Martin. The show characterized many of Frank and Dean's popular songs and comedy routines. Also, many in the group took extra time to explore the upper decks of the boat and take in the beautiful views of the Pittsburgh skyline. To see pictures from the outing, visit our Facebook page at www.facebook.com/pages/Bauer-Family-Funeral-Homes/169734884825. Information about September's event will be made available soon; keep checking the website, Facebook and local newspapers for details. On Tuesday, August 28, 2012, Bauer-Hillis Steps Ahead will tour the DeBence Antique Music World Museum in Franklin. The museum houses an incredible rare collection of more than 100 antique mechanical musical instruments that spans two centuries. The collection is showcased by a wide range of antiques that have either musical or local significance and we will see and hear many of these mechanical marvels deliver their music of yesterday. Also, the lighting in the museum is provided by over 40 Tiffany-style hanging lamps. A catered buffet luncheon, including chicken salad croissants and ham and swiss croissants, roasted red skin potatoes, salad, yam souffl�, homemade chocolate chip and iced sugar cookies, and iced tea and lemonade will be served in the museum's event room. Bauer-Hillis Steps Ahead offers a great way to stay connected with the community and anyone interested is welcome to join. For more information about the group or the schedule and cost of August's event, call the Bauer-Hillis Funeral Home at 814-473-3080 or 724-756-2710. Reservations are due by Tuesday, August 21, 2012. Read more about past excursions on our website or become a fan on Facebook. Bauer-Hillis Funeral Home in Rimersburg is delighted to participate in this year's Cookie Daze Festival, which will take place Friday, August 10 through Sunday, August 12. "Cookie Daze is a wonderful way for the Rimersburg community to come together and enjoy a weekend of fun," said Deana R. Turner, manager and funeral director at Bauer-Hillis Funeral Home. "We love being a part of this community and Bauer-Hillis is excited to partner with local groups to offer these educational and enjoyable events for families." This year's festival has a Civil War theme, so Bauer-Hillis Funeral Home is working with the Veterans Museum in Rimersburg to stage a reenactment of a Civil War funeral. A horse-drawn hearse carrying a period coffin will be featured in the Northwest Savings Bank Parade that begins at 6:30 p.m. on Friday. Richard D. Hillis will accompany the hearse dressed as an undertaker and Civil War soldiers will walk beside the coffin. After the parade, a mock Civil War funeral will take place at Veterans Park with Pastor Dan George officiating, and from 7:30-9:30 p.m. pony rides will be available for children in the funeral home parking lot. Throughout the weekend the funeral home will also display a number of antique funeral collectables at Veterans Park. On Saturday, Bauer-Hillis will sponsor the Power Wheels Races, which will begin in the funeral home's parking lot. Registration begins at 9:30 a.m. at the funeral home and the race starts at 9:45 a.m.
To wrap things up on Sunday, Bauer-Hillis is showing a family movie in the parking lot. Beginning at 6 p.m., a DJ will play music while people gather and enjoy refreshments sold by local groups; Friends of the Library will sell candy and snacks will be available for purchase from area community organizations. The movie, Dolphin Tale, will start at dusk. Everyone attending should bring their own seating. "Rimersburg holds as a special place in their heart for the area Veterans and we are thrilled to have been asked to participate in the historical programs. Community festivals such as Cookie Daze are a wonderful opportunity for the businesses to give back to the area residents and show our appreciation of their patronage." said Turner. On Tuesday, July 24, 2012, Bauer-Hillis Steps Ahead traveled by bus from Rimersburg to Schenley, PA where the group boarded the Kiski Junction Railroad. Since it was such a beautiful day, the group chose to sit in the open train car equipped with tables and a canopy top. A picnic lunch was provided before the train left the station and the hour-long train ride included a narration of local history and folklore as it toured the Kiski River. The train also traveled over a bridge originally built in 1899 where the Kiski River meets the Allegheny River, and attendees had a beautiful scenic view for photographs. For some that attended this was their first train ride, while others reminisced about their experiences of when they rode the passenger trains that regularly ran from Armstrong County to Pittsburgh. Plans for August's excursion will be announced soon, so look out for details! Bauer-Hillis Steps Ahead offers a great way to stay connected with the community and anyone interested is welcome to join. For more information about the group or the schedule and cost of the next event, call the Bauer-Hillis Funeral Home at 814-473-3080 or 724-756-2710. On Tuesday, July 17, 2012, the Bauer-Hillis Funeral Home in Rimersburg sponsored a free night swim at the Union COG Pool in Sligo. The first 100 guests that arrived from 5-7 p.m. received free admission courtesy of the funeral home. Attendees did not just have swimming to keep them occupied, however — the funeral home had food and games for families to enjoy at the Vidunas Pavilion. This free evening of fun was the July event for "Twelve Months of Giving Back", the funeral home's year-long celebration of the centennial service milestone for Bauer-Hillis Funeral Home. "Everyone really seemed to enjoy this event and we are glad we could provide a fun evening for local families," said Deana R. Turner, manager and funeral director at Bauer-Hillis. "We hope that community members can see how much we appreciate their support through these monthly events. The funeral home would not be able to celebrate this milestone without them." While some people were having fun in the pool, others ate hot dogs, snacks, fruit and cupcakes in the pavilion. Near the end of the evening some of the kids played games which included crab soccer, whipped cream chocolate kiss search, and water balloon battles. "This was a wonderful opportunity for local residents to come out with their families and have a great time, and we hope everyone is looking forward to the activities we have planned for the rest of the year!" said Turner. "Twelve Months of Giving Back" will continue throughout 2012. To find out about our monthly events, visit www.bauerhillisfuneral.com, watch the local newspapers or call 814-473-3080. Photo: Community members enjoy food and games under the Vidunas Pavilion at the Sligo Pool. Three area funeral directors were recently recognized at the Western Pennsylvania Funeral Director's Convention held at the Ambassador Conference Center in Erie, PA Monday, June 18 through Wednesday, June 20, 2012. Deana Turner, manager and funeral director of the Bauer-Hillis Funeral Homes in Petrolia and Rimersburg, was appointed president of the association for 2012-2013 at the conclusion of the annual convention. This year's convention was dedicated to Funeral Director H. Jack Buzard of the Buzard Funeral Home in Eau Claire and Parker for recognition of his 25 years of service to WPFDA since serving as president for the period 1986-1987. Serving local families in the communities of Eau Claire and Parker, Jack has been in funeral service for more than fifty years. In 2007 Buzard's son, Funeral Director Stephen J. Buzard joined the family firm. Following family tradition, Stephen was appointed to his first term as a board member with the Western Pennsylvania Funeral Directors Association with his term for president being 2015-2016. Other area funeral directors presently serving on the board include board treasurer, Stephen J. Geibel of Geibel Funeral Home in Butler and board director, Rick A. Goble of Goble Funeral Home in Clarion. Ms. Turner said of her appointment, "I would like to thank both the officers and the board members of the association for their support and commitment to our profession. I am honored to be entrusted with the leadership of the association, and will strive to provide a new level of active support for and advocacy on behalf of our membership." Turner graduated with honors from Carlow University with undergraduate degrees in Communication and Finance Management. She obtained an associate degree in funeral practice and technology from the Pittsburgh Institute of Mortuary Science, and in 2010 earned the designation of Certified Funeral Service Practitioner (CFSP), one of only 48 funeral directors in the state of Pennsylvania that have distinguished themselves among their peers within the funeral service profession as they continue their education to exceed the highest standards of care. This achievement is especially notable because CFSPs have voluntarily elected to participate in quality educational and service opportunities that far surpass what the funeral service licensing board in their state requires. She resides in Chicora with her husband, John, and two daughters, and is a member of the Chicora-East Brady Rotary Club, the Rimersburg Chamber of Commerce, board treasurer for the Karns City Youth Football program and an adjunct instructor for the Pittsburgh Institute of Mortuary Science. Her professional memberships include the National Funeral Directors Association, the Pennsylvania Funeral Directors Association, and Selected Independent Funeral Homes. On Monday, August 6, 2012, join Bauer Steps Ahead as we experience a "Vegas Getaway" aboard the Gateway Clipper. This exciting cruise along the Three Rivers will feature Bo Wagner's "Frank and Dean Revue" live tribute that pays homage to Rat Pack musicians Frank Sinatra and Dean Martin. A delicious buffet luncheon will be offered on board. Meet at the Bauer Funeral Home in Kittanning for bus transportation at 8:30 a.m. The cost is $64 for bus transportation, lunch and cruise ticket. Money and reservations are due by Wednesday, July 25, 2012. Please call Sandy at 724-545-9464 for reservations and questions. Guests are welcome. Looking for a fun way to cool off with your family during these hot summer days? Come to the Union COG Pool in Sligo on Tuesday, July 17, 2012 from 5-7 p.m., where the first 100 guests will receive free admission courtesy of the Bauer-Hillis Funeral Home in Rimersburg. This free evening of entertainment is the July event for "Twelve Months of Giving Back", the funeral home's year-long celebration of the centennial service milestone for Bauer-Hillis Funeral Home. "This will be a great evening for families and area residents of all ages to swim and just have fun" said Deana R. Turner, manager and funeral director at Bauer-Hillis. "We are happy that we can say 'Thank you' to the community in such a perfect way during the summer." Guests will not only enjoy swimming, but the funeral home staff will grill hot dogs and provide additional snacks under the Vidunas Pavilion. Also, a number of family-friendly games will be available to play and the activities will be exciting for all ages. "I hope community residents are able to come and enjoy this evening of free fun at the Sligo Pool," said Turner. "We are truly grateful for the continued support over the years, and we hope to be able to serve this area for many, many more." On Thursday, June 28, 2012, Bauer Steps Ahead traveled to the Chadwick Event Center in Wexford, PA to see "Sounds of Hollywood". Performed by the professional Pops Orchestra, singers and dancers of Latshaw Productions, the program paid homage to films from the golden age of Hollywood to the blockbusters of today. Before the show, the group enjoyed a delicious hot lunch in the Chadwick's elegant ball room. Everyone in attendance agreed that the musicians and performers put on a fantastic show and hopes Bauer Steps Ahead is able to return in the future. To see pictures from the outing, visit our Facebook page at www.facebook.com/pages/Bauer-Family-Funeral-Homes/169734884825. Information about July's event will be made available soon; keep checking the website, Facebook and local newspapers for details. Bauer Steps Ahead offers a great way to stay connected with the community and anyone interested is welcome to join. For more information about the group and to make reservations for future events, please call the Bauer Funeral Home at 724-545-9464. On Thursday, June 28, 2012, the staff of the Bauer-Hillis Funeral Home in Rimersburg said thank you to the staff of New Bethlehem Burial by giving them an ice cream social. The monthly ice cream socials are part of "Twelve Months of Giving Back", the year-long campaign develop to thank the entire Rimersburg community in celebration of the 100 year anniversary of the funeral home. Each month the funeral home chooses a different local business that is important to the success of the community and the funeral home, and New Bethlehem Burial definitely fits the bill. "New Bethlehem Burial, like Bauer-Hillis, is a family-run business and has served the area since 1929," said Deana R. Turner, manager and funeral director at Bauer-Hillis Funeral Home. "We are happy to support this company that understands the importance long-time service to an area,"
"New Bethlehem Burial is not only important to the community, but it is essential to our funeral home's success," said Turner. "Bauer-Hillis exclusively sells New Bethlehem Burial concrete vaults, so our families regularly use their product." Turner is not only happy with the quality of the vaults, but also speaks highly of the New Bethlehem Burial staff. "Every time one of our families order a concrete vault, the company's staff comes to set the vault and bring other settings, like chairs and tents, if requested," said Turner. "New Bethlehem Burial's staff is always courteous, polite and committed to helping the family however they can; they will even serve as pallbearers if necessary." Turner and other Bauer-Hillis staff members served the ice cream to the office staff, plant personnel and delivery personnel. "We hope they all enjoyed the ice cream and realize just how much they do for our community," said Turner. Want to see more pictures from the event? Visit our Facebook page at www.facebook.com/pages/Bauer-Family-Funeral-Homes/169734884825 and check out the album! Photo credit: Service associates Susan Carnathan and Dan George help serve ice cream for the employees of New Bethlehem Burial. On Tuesday, June 26, 2012, Bauer-Hillis Steps Ahead traveled to Butler County's Moraine State Park to take a privately chartered cruise on Lake Arthur. A personal guide welcomed the group aboard the Nautical Nature, a fully enclosed pontoon boat. The Captain made the cruise very comfortable and the guide acquainted guests with the area's natural history and wildlife. Everyone enjoyed a delicious box lunch and appreciated the beautiful scenery around the pristine waters of Lake Arthur. The next event will be held on Tuesday, July 24, 2012 when the group will journey to Schenley, Armstrong County to ride the Kiski Junction Railroad, a working short-line railroad. A narrator will be on board to highlight the local history and lore while everyone enjoys the spectacular views of the scenic Kiski and Allegheny Rivers. This hour-long ride will also feature how the railroad works today. Tables will be reserved in the caboose and once aboard pizza will be served. Participants will need to meet at Bauer-Hillis Funeral Home in Rimersburg at 11:30 AM the day of the event. The cost is $32 and includes bus transportation, the train ticket and pizza. Call Sandy at 814-473-3080 or 724-756-2710 as soon as possible before July 20 to make reservations because seating is limited, and guests are welcome. On Thursday afternoon under the sunshine, Eccles-Lesher summer reading program participants and staff members were treated to a campfire complete with hot dogs and smores courtesy of the Bauer-Hillis Funeral Home. "The collaborative effort with the Eccles-Lesher summer reading program is the June event for 'Twelve Months of Giving Back', our year-long celebration of the centennial service milestone for Bauer-Hillis Funeral Home in Rimersburg," said Deana R. Turner, manager and funeral director at Bauer-Hillis. "We wanted to show the community our appreciation of their support over the last 100 years, and what better way to do so than to provide area children a sweet treat complimented by great books amidst the sunshine at Veteran's Memorial Park." Twenty-Four summer reading program participants as well as staff and parent volunteers enjoyed refreshments, hot dogs fresh off the grill and smores cooked over a campfire while intently listening to two reading selections from the library staff. "It's always a treat for us to work with the area children, especially in conjunction with a rewarding and enriching program as the summer reading series from the library," said Turner. "We have a valuable resource in our community and appreciate the staff and volunteers and their efforts." On Wednesday, June 13, 2012, the staff of the Bauer-Hillis Funeral Home helped the Rimersburg Senior Center celebrate Older American's Month by serving lunch to the center's volunteers. Larry Bliss, funeral director, Dan George and Susan Carnathan, service associates, and Sandy Mikita, community relations manager, all had a wonderful time participating in the Hawaiian luau-themed party. Kelly Fair, director of the center, organized the party and many attendees had fun keeping with the spirit of the tropical theme by wearing grass skirts and leis over their regular clothes. Tropical and fresh fruit along with meat and cheese trays were served as appetizers before the main course, and after the meal, a large cake decorated with the 2012 Older American's Month slogan, "Never Too Old to Play", was served for desert. Kelly was also part of a beach vacation comedy skit that everyone enjoyed. A $25 gift certificate to Joe's Pizza was donated by the Bauer-Hillis Funeral Home for the door prize. The Clarion County Commissioners were also special guests and delivered a proclamation recognizing those who help with all the lunches and affairs held at the center every week throughout the year. On Wednesday, May 30, 2012, the Bauer Steps Ahead group had a great time when they toured the National Aviary in Pittsburgh. Personal guides were on hand to lead the group through the various man-made natural environments that are home to more than 600 rare and beautiful birds. The grasslands, wetlands, tropical forest and the penguin exhibits were just a few of the intimate settings that let participants become familiar with the birds' antics, personalities and natural histories. Some members even volunteered to take part in the feeding of exotic birds as they took flight within the exhibit. A delicious "Lunch on a Fly" was served in the Caf� Classroom followed by a unique close encounter with three of the most popular birds. On Thursday, June 28, 2012, you are invited to join Bauer Steps Ahead as we experience "Sounds of Hollywood" performed by the professional Pops Orchestra, singers and dancers of Latshaw Productions. This exciting 90-minute show pays homage to films from the golden age of Hollywood to the blockbusters of today. Prior to the show, a hot lunch will be served in the formal ballroom at The Chadwick in Wexford. Participants will meet at the Bauer Funeral Home in Kittanning for bus transportation at 9:15 a.m. Lunch will be served at 11:30 a.m. followed by the 90-minute matinee at 1 p.m. The cost is $60 for bus transportation, lunch and the show ticket. Money and reservations are due by June 21, 2012. Bauer Steps Ahead offers a great way for local residents to stay connected with the community and anyone interested is welcome to join. Please call Sandy at 724-545-9464 for reservations or questions. Guests are always welcome. To help Rimersburg residents celebrate Memorial Day, the Bauer-Hillis Funeral Home in Rimersburg is giving 100 handheld flags to local residents before the Memorial Day parade in Rimersburg. This giveaway is part of the funeral home's centennial service campaign, "Twelve Months of Giving Back", where each month Bauer-Hillis sponsors an event for the community at large. "Memorial Day is a time to remember all of the people who have fought and died for our freedom," said Deana R. Turner, manager and funeral director at Bauer-Hillis Funeral Home. "Since there are so many US veterans in the area, we especially wanted to give people a way to show their patriotism during Memorial Day. To receive a free hand-held flag, visit the Bauer-Hillis Funeral Home on Main Street before the parade begins at 9 a.m. The first 100 people who arrive will receive a free flag. "This year our funeral home is giving back to the community that has supported us for the past 100 years, and our staff hopes that the community will take this opportunity to encourage all the people who have fought for us," said Turner. "It will be a special time of remembrance and reflection." On Thursday, May 24, 2012, Bauer-Hillis Steps Ahead traveled to Indiana, PA to experience a bit of Hollywood magic as they visited the Jimmy Stewart Museum during the month of his birthday. A historian guided the group through the numerous galleries that showcased the memorable life and film career of Jimmy Stewart, and the highlight of the trip was the 45-minute documentary film presentation, "The Making of a Wonderful Life", shown in the 50-seat film theater. After the film, everyone enjoyed a delicious box lunch that was catered to the museum. For those who were true fans, shopping at the museum store, "The Shop Around the Corner", to purchase Jimmy Stewart memorabilia and classic films on video was a real treat. The next Bauer-Hillis Steps Ahead event will be Tuesday, June 26, 2012, when the group heads to Butler County's Moraine State Park for a chartered boat cruise on the pristine waters of Lake Arthur. A personal guide on the "Nautical Nature" will share about the area's natural history and osprey reintroduction while guests enjoy the unique scenery and wildlife sightings. The fully-enclosed passenger tour boat is handicap accessible, offers comfortable seating and has restroom facilities on board. A box lunch including a croissant sandwich (with selections of ham, turkey, roast beef, ham salad, chicken salad or tuna salad), rigatoni, fruit salad, a cookie and drink will be served on board. After the cruise the group will visit the Owlet Gift Shop. Attendees will meet at the Bauer-Hillis Funeral Home in Rimersburg at 10:30 a.m. The cost is $47 and includes bus transportation, the cruise and a box lunch. Call Sandy at 814-473-3080 or 724-756-2710 by June 19, 2012 to make reservations. As always, guests are welcome. Bauer-Hillis Steps Ahead offers a great way to stay connected with the community and anyone interested is welcome to join. Read more about past excursions on www.bauerhillisfuneral.com or become a fan on Facebook. 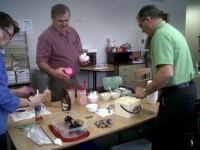 On Wednesday, May 23, 2012, the staff of the Bauer-Hillis Funeral Home in Rimersburg treated the employees and customers of Clarion County Community Bank in Rimersburg to an ice cream social as part of "Twelve Months of Giving Back". The year-long campaign is a way to thank the entire Rimersburg community in celebration 100 year anniversary of the funeral home. "Clarion County Community Bank has been a vital part of the community for a number of years," said Deana R. Turner, manager and funeral director at Bauer-Hillis Funeral Home. "We wanted to celebrate their commitment to making Rimersburg a better place." Turner said that between 11:30 a.m. and 1 p.m. the funeral home staff served nearly two dozen employees and customers. "I hope everyone enjoyed themselves�I know our staff had a great time," said Turner. "I would also like to thank the Rimersburg Branch Manager, Valerie Hile, for allowing us to serve the employees and patrons of the bank. We appreciate their support." Each month a local business or organization that has been instrumental to the success of Rimersburg and the Bauer-Hillis Funeral Home throughout the last century will be surprised with the treat, so there are still a number of people to be honored. Want to know June's recipient of the ice cream social? Keep watching our website, www.bauerhillisfuneral.com, our Facebook page and local newspapers to see who is selected next�the announcement could come at any time! Funeral Director, Jack Bauer, Community Relations Manager, Sandy Mikita, and Service Associates, Bobbi Ruth Blinn and Ron Rumbaugh, were four of the many who volunteered their time at the Dayton Fire Department's Threshermans Dinner. On Thursday, May 10, 2012, the semi-annual fundraising dinner and the nice weather brought hundreds of local people to support the Dayton Fire Hall's fund raising efforts. "It takes many volunteers to prepare, serve and clean-up for a full day of activities," said Bauer. "We were glad to help out the Dayton Fire Department and we all had a great time." On Thursday, May 10, 2012, Joshua C. Starr, funeral director and Sandra Mikita, community relations manager, of Clark Chapel Funeral Home attended Career Day at Elderton Elementary School. Small groups of fifth and sixth grade students rotated among twenty presentations to hear about a variety professions. Starr spoke on his role as a funeral director. Starr put together a 3-D map to help the kids visualize a typical role a funeral director follows when the funeral home is called upon. He also explained the many duties he is responsible for and made it a point to tell them that there are an equal number of males and females in the profession. "The kids seemed to be really interested in funeral related activities and asked very intelligent questions," said Starr. "I'm excited that I was able to share about my profession and hopefully I communicated just how rewarding it is." Mikita then talked with them about her role as a cemetery memorial designer. She took them through the steps that are taken from doing a temporary marker to designing a permanent cemetery monument. Students were able to do a rubbing, which is an impression of the visible surface of the monument and a way of duplicating a design. She explained about the differences in material used and the engraving procedure. "We were very pleased to be a part of the Career Day and to offer these youths another choice in addition to the many different professions represented," said Mikita. Photo Credit: During Career Day, Joshua C. Starr educates Elderton Elementary students about the funeral process. For most students, prom is a highlight of their high school years. However, it is also a dangerous night, as each year approximately 375 students across the country lose their life due to driving under the influence. To help students realize the dangers of drinking and driving, The Bauer-Hillis Funeral Home of Petrolia partnered with the Karns City Area High School staff and administration to present the Prom Promise program. On Monday, May 7, 2012, the Bauer-Hillis Funeral Home, faculty, administration and students of Karns City, five local volunteer fire departments (Petrolia, Chicora, East Brady, Sugarcreek and Bruin), the Butler State Police and the Butler and Armstrong County Coroners Offices came together to present a graphic portrayal of what can happen when students drink and drive on prom night. Approximately 330 10th through 12th graders watched as a mock crash played out in the school parking lot. Six students in two cars were involved in the crash; two were innocent bystanders whose car was hit by a car carrying four teenagers from the prom whose driver had been drinking. After students saw the initial set up of the crash, they watched as over 20 responders from the five fire departments and EMS teams arrived and started assessing the scene. The two girls in the extra car, Carly Potchak and Lacee Sheerbaum, and the male passenger in the prom car, Chris Znosko, were taken away in an ambulance and the two girls in the prom car, Marissa Fleeger and Brenna Ritzert, were pronounced dead at the scene. The drunk driver in the scenario, Jarrod Ellenberger, was given a sobriety test, arrested and taken away in handcuffs by Trooper Joshua Anderson of the Butler State Police. The mock crash is the first part of a three-year Prom Promise series; the second year will feature a mock trial for Ellenberger, the alleged drunk driver from this year's presentation, and year three is a DUI victim presentation. After the crash scene was finished, students were led to the auditorium to listen to a speech from Armstrong County Coroner and Commissioner, Robert Bower, who has seen first-hand the effects of driving under the influence. He explained the real dangers of drunk driving and how it can have an impact on the family and friends of the driver, family and friends of victims and the driver himself. As students exited the auditorium, they passed by Ritzert lying in a casket as a reminder of the consequences of driving under the influence. Michael Turner, Chicora EMS volunteer and deputy coroner for Butler County, narrated as the scene unfolded so that the observers understood everything that was happening, and student Katie Roxby photographed the event. "Some may think the presentation is graphic," said Deana R. Turner, manager and funeral director of Bauer-Hillis Funeral Home of Petrolia, "but our goal was to show them what a real DUI accident looked like." "Between my staff, the students, the fire and EMS teams and the police, we gave a very realistic portrayal of a crash scene," said Turner. "The students were very attentive and we hope this program helps them make the right decision come prom night�or any night for that matter." Turner also stresses that without the help of so many volunteers, this event could have never happened. In addition to the above mentioned groups and individuals, Turner would also like to thank John Burnett, athletic director at Karns City Area High School; William Young III, Butler County coroner; Rumbaugh Towing Service of Chicora; Charles Barnes, fire chief of the Petrolia Fire Department; the faculty, staff and administration of Karns City Area High School; and the National Honor Society student volunteers. "This group was amazing and I am so impressed with how well they worked together to make this as real of an experience as possible for the students," said Turner. "We all hope the teenagers take this message and remember the consequences of driving under the influence." Photo credit: Karns City students Jarrod Ellenberger, Chris Znosko, Marissa Fleeger and Brenna Ritzert helped act out the mock crash by posing as students who were drinking and driving on prom night. Local fire and EMS crews show the students what they do when responding to an accident. On Thursday, May 24, 2012, Bauer-Hillis Steps Ahead will visit The Jimmy Stewart Museum in Indiana, PA. Participants will experience a bit of Hollywood magic during the month of Jimmy Stewart's birthday as a personal guide highlights the numerous galleries depicting the memorable life and film career of Jimmy Stewart. The group will see a 45-minute documentary, "The Making of a Wonderful Life", in the 50-seat film theatre and can also shop at the museum's store, "The Shop Around the Corner". A box lunch including a turkey or chicken salad croissant, pasta salad, fresh fruit, chips, desert and beverage will be served at the museum and special diet choices are available. Those attending will meet at the Bauer-Hillis Funeral Home in Rimersburg for bus transportation at 8:45 AM. The cost is $27 and includes transportation, a guided tour and a box lunch. Bauer-Hillis Steps Ahead is open to anyone wanting to stay connected to the community. For more information about the group or to reserve a spot for the May event, call Deana Turner or Sandy Mikita at 814-473-3080 or 724-545-9464 by Monday, May 21, 2012. On Friday, April 27, 2012, the staff of the Bauer-Hillis Funeral Home devoted their time to make Rimersburg even more beautiful. For two hours, staff members swept six blocks of downtown along Route 68, from the stoplight to the funeral home. This project is the April activity of "Twelve Months of Giving Back", the year-long celebration of the centennial service milestone for the Bauer-Hillis Funeral Home in Rimersburg. Because the borough will soon be starting the annual repainting of the streets, the funeral home staff wanted to make sure the sidewalks and streets were in tip-top shape. "During this year of thanking the community for their support, we wanted to do something for the whole town." said Deana R. Turner, manager and director or Bauer-Hillis Funeral Home. "We hope this beautification project uplifts the community and makes it easier for the borough employees to do their jobs." Participants in the road clean up stayed busy as they cleaned the streets. With brooms and shovels, the crew of eight managed to fill two 55-gallon trashcans with dirt and debris. They even enjoyed a coffee break courtesy of the employees of Clarion County Community Bank, who appreciated the funeral home staff's efforts. Participating staff included Manager, Deana Turner, Funeral Directors, Jack Bauer, Mark Thompson and Larry Bliss, and Funeral Service Associates, Frank Soloski, Bob Carmichael, Ralph Funkhouser and Wally Artman. There are still eight months left for this campaign, so keep checking back to see what's coming up next! Photo Credit: Funeral Directors Mark Thompson and Jack Bauer clean dirt and debris off of Route 68 in downtown Rimersburg. On Wednesday, May 30, 2012, Bauer Steps Ahead will experience a memorable brush with nature when the group visits the Pittsburgh National Aviary. The Aviary houses the most diverse bird collection in North America and more than 600 rare and beautiful birds can be viewed in an intimate setting that is lush and vibrant. Participants will enjoy "Lunch on a Fly", which will be served in the Caf� Classroom at the same time as a unique close encounter with some of the most popular birds. Lunch will include assorted sandwiches, pasta salad, fresh fruit and beverages. Special diet choices are available. The cost is $42 for bus transportation, lunch and tour. Attendees will meet at the Bauer Funeral Home in Kittanning for bus transportation at 7:45 AM. The guided tour will begin upon arrival to the Aviary and lunch will be at approximately 11 AM. Bauer Steps Ahead is open to anyone wanting to stay connected to the community. For more information about the group or to reserve a spot for the May event, call Sandy at 724-545-9464 before May 23, 2012. The 2012 Administrative Professional Day marks its 60th anniversary with the theme, "Admins, the Pulse of the Office". Across the United States, downsizing has forced all office staff to pull together and work harder in the workplace. Over the decades, the job of the administrative professional has changed dramatically thanks to new tools, techniques and shifts in the economy. We take this opportunity to recognize Tammy Carson, Office Manager, and her assistant, Kayla Price, both of Bauer Family Funeral Homes. While carrying out the everyday administrative functions, Tammy and Kayla play a vital role in caring for families too. We all value their professional knowledge, organization and accounting skills, and appreciate all the sacrifices they make. Also, we express our grateful appreciation to the office staff of various churches and professional offices that the Bauer Family Funeral Homes often call upon. Deana Turner was among the many members of Selected Independent Funeral Homes attending the association's Spring Management Summit in Atlanta, GA on April 16-18. Turner is the Manager of the Bauer-Hillis Funeral Homes in both Petrolia and Rimersburg. "This meeting focused on key human resource topics relevant to funeral service," said Turner. "I gained valuable insight and information by networking with my independent funeral director colleagues and by attending sessions that will help our funeral home serve the families of our community with an even higher level of compassion and care." Featured speakers at the meeting included Pat McGraw, HR Manager for Zingerman's Community of Businesses; Ann Lofgren, Consultant at Zingerman's; and Marguerite Ham, owner of Igniting Success. Meeting participants also shared a roundtable discussion session that provided them an opportunity to openly exchange questions and ideas in developing new approaches for better serving client families and operating successful businesses. Selected Independent Funeral Homes was founded in 1917 and is the world's oldest and largest association of independently owned funeral homes. Its members represent the "best in class," and the association actively promotes the use of best practices by its members in providing consumers with the finest care available. "One of the many ways our members demonstrate commitment to providing quality funeral services is through adherence to the association's Code of Good Practice," said Robert J. Paterkiewicz, Executive Director of Selected Independent Funeral Homes. "They understand the enormous responsibility they have to the families and communities they serve. We are pleased that Deana is continuing this long tradition by representing Bauer's at our Spring Management Summit." Bauer Family Funeral Homes is a family owned and operated firm that has been caring for area families since 1947. With locations in Rimersburg, Petrolia, Kittanning, Elderton and Dayton, the Bauer family and staff are dedicated to offering the finest funeral service with attention to compassion, dignity and respect. On Tuesday, April 24, 2012, the staff of the Bauer-Hillis Funeral Home in Rimersburg treated the employees and customers of the Northwest Savings Bank in Rimersburg to an ice cream social in celebration 100 year anniversary of the funeral home. The funeral home launched the campaign, "Twelve Months of Giving Back", in January and each month the Bauer-Hillis staff will surprise one local business or organization with an ice cream social. "Northwest Savings Bank is so supportive of the Rimersburg community, and we wanted to not only thank them for their support of Bauer-Hillis, but for their kindness to the community at large," said Deana R. Turner, manager and funeral director of the Bauer-Hillis Funeral Home. "Businesses are not always involved in the communities they serve, so we want to recognize Northwest Savings Bank for their dedication to the area." In addition to treating the employees, the Bauer-Hillis staff served ice cream to the bank's customers that arrived between 11:30 a.m. and 1 p.m. "We thought this would be a fun way to involve other community members in this celebration," said Turner. Each month a local business or organization that has been instrumental to the funeral home's success throughout the last century will be surprised with the treat, so there are still a number of people to be honored. Want to know May's recipient of the ice cream social? Keep watching our website, www.bauerhillisfuneral.com, our Facebook page and local newspapers to see who is selected next�the announcement could come at any time! On Wednesday, April 11, 2012, Bauer Steps Ahead enjoyed an outing to the Phipps Conservatory and Botanical Gardens in Pittsburgh. The group met at the Bauer Funeral Home in Kittanning and then boarded a bus that took them to the nation's oldest and largest Victorian greenhouse to see the Spring Flower Show. Once there, participants were given a tour of the beautiful gardens representing many cultures throughout the world. Highlights included a colorful Dutch tulip display, Tropical Forest India and beautiful exhibitions representing France, the United Kingdom, China and a number of other countries. The group was also treated to a wonderful lunch served by the Phipps staff. May's Bauer Steps Ahead trip will be announced soon, so check back for details. Bauer Steps Ahead offers a great way to stay connected with the community and anyone interested is welcome to join. For more information, please call Sandy Mikita at 866-235-7683. Look at photos from the concert trip by visiting our Facebook page: www.facebook.com/pages/Bauer-Family-Funeral-Homes/169734884825. On Wednesday, March 28, 2012, Bauer-Hillis Steps Ahead had a wonderful time on its first outing: A Chocolate Affair! Participants traveled to the Clarion County Career Center in Shippenville to first enjoy a gourmet lunch prepared by Chef Randy Shook and the students of the Culinary Arts Department. After lunch, the students shared a presentation that highlighted the characteristics, fun facts and history of chocolate. They even showed an example of a chocolate facial! The group also enjoyed a number of mouth-watering chocolate samples, including French Chocolate Bark, Dark and White Chocolate Ganache Fondue and Chocolate Pasta served with Raspberry Cream Sauce. Bauer-Hillis Steps Ahead is a new outreach program and open to anyone wanting to stay connected to the community. To learn more about the group and how to participate, please call Sandy Mikita or Deana Turner at 814-473-3080. On Wednesday, April 11, 2012, Bauer Steps Ahead will be traveling to Phipps Conservatory and Botanical Gardens in Pittsburgh to enjoy lunch and a guided tour. The nation's oldest and largest Victorian greenhouse is now featuring its Spring Flower Show, a celebration of gardens across the globe. Highlights include a colorful Dutch tulip display and beautiful exhibitions representing France, the United Kingdom, China and a number of other countries. The cost is $46 for bus transportation, lunch and tour. Menu choices for lunch are forthcoming. Meet at the Bauer Funeral Home in Kittanning for bus transportation at 9 AM. Lunch will be served upon our arrival to Phipps at 11 AM and the guided tour will follow. Bauer Steps Ahead is open to anyone wanting to stay connected to the community. For more information about the group or to reserve a spot for the April event, call Sandy at 724-545-9464 before April 2, 2012. Bauer Funeral Home, Inc. is happy to congratulate Joshua C. Starr, funeral director, for being named a deputy coroner for Armstrong County. On Tuesday, March 6, 2012 at 9 a.m., Starr was sworn in at the Armstrong County Court House by Brenda C. George, prothonotary and clerk of courts for Armstrong County. Armstrong County Coroner, Robert T. Bower, and Chief Deputy Coroner, Alan Thomas, were also in attendance. Starr is excited about this new role because it will give him the opportunity to serve the residents of Armstrong County. "I feel that I have gained valuable experience working as a funeral director," said Starr, "and I plan to use this knowledge to help the residents of Armstrong County who have experienced loss." In 2009, Starr began his career with Bauer Funeral Home, Inc. as a funeral intern and was promoted to licensed funeral director in 2010 after passing his state and national exams. His interest in working with the coroner's office began a little over a year ago and he approached Bower about how he could become more involved with the coroner's office. "I attended coroner's training at the Pennsylvania State Police Academy in Hershey from November 28 until December 3, 2011 and passed the Pennsylvania State Coroner's Exam," said Starr. "While at the training, I learned about all the different facets of the coroner's office: mental health, disease processes and death scene investigation, as well as legal procedures and proceedings. Jennifer Bauer Eroh, president of Bauer Family Funeral Homes, is happy for Starr's accomplishment. "He has worked very hard toward this goal and our firm supports him 100 percent. We are proud to have another staff member working to support the community." For more information, visit www.bauerfuneral.com or call 724-545-9464. On Sunday, March 4, 2012, the Bauer Steps Ahead group enjoyed a trip to the Indiana University of Pennsylvania concert, "A World of Song", at Calvary Presbyterian Church in Indiana, PA. Directed by Heather Zosel, the school's Chorale, Chorus and Chamber Singers treated the audience to beautiful music from a variety of cultures around the world. Before leaving from the Bauer Funeral Home in Kittanning, attendees enjoyed a time of snacks and fellowship. April's Bauer Steps Ahead activity will take place at the Phipps Conservatory and Botanical Gardens in Pittsburgh. Attendees will take part in a docent-led tour of the beautiful grounds and also eat lunch. More information will be announced soon, so check back for details of how to sign up. All this week, the staff of Bauer-Hillis Funeral Home in Rimersburg treated the teachers, aides and administration personnel at the Union School District to an ice cream social in celebration 100 year anniversary of the funeral home. As part of the funeral home's celebration campaign, "Twelve Months of Giving Back", the Bauer-Hillis staff will be surprising one local business or organization with the ice social each month. The Union High School staff received the ice cream social on Monday, the Rimersburg Elementary staff was given the dessert on Wednesday and the Sligo Elementary staff enjoyed the treat on Friday. "We hope the staff of the Union School District enjoyed the ice cream and fellowship," said Turner. "The teachers, aides and administrators give so much to the community in how they teach our kids�we are so grateful for their hard work." Each month a local business or organization that has been instrumental to the funeral home's success throughout the last century will be surprised with the treat, so there are still many more people to be honored. Want to know March's recipient of the ice cream social? Keep watching our website, www.bauerhillisfuneral.com, our Facebook page and local newspapers to see who is selected next�the announcement could come at any time! On Friday, March 02, 2012, the Bauer-Hillis Funeral Home in Rimersburg celebrated Read Across America Day with the students of Sligo Elementary by reading "In A People House" by Dr. Seuss. Deana Turner, manager and funeral director of Bauer-Hillis Funeral Homes, assisted Larry Bliss, funeral director, as he dressed up as the Cat In the Hat and acted and read the story to the kindergartners and first graders. After the reading, the staff taught the kids about what it means to turn 100 and discussed different people, businesses and organizations that were 100 years old. "Today is the 108th birthday of Dr. Seuss and this year is the 100th birthday for the funeral home in Rimersburg," said Turner. "They had a wonderful time participating and we even sung "Happy Birthday" to Dr. Seuss and the Bauer-Hillis Funeral Home!" The students were treated to birthday cake after the lesson and received a hardcover copy of a Dr. Seuss book as they were leaving. "Bauer-Hillis puts the community first and wants to thank the residents for their support." said Turner, "Larry and I were thrilled for the opportunity to interact with these kids. We would like to thank the staff at Sligo Elementary for allowing us to lead this program�we hope the kids enjoyed it!" This event at Sligo Elementary was the March activity for "Twelve Months of Giving Back", the year-long celebration of the centennial service milestone for the Bauer-Hillis Funeral Home in Rimersburg. There are still nine months left for this campaign, so keep checking www.bauerhillisfuneral.com to see what's coming up next! Bauer-Hillis Funeral Home is proud to introduce a new community program, Bauer-Hillis Steps Ahead. This unique outreach program was developed to offer support to bereaved families through continued fellowship and friendship. "The group welcomes anyone who wants to remain connected to the community, experience an enjoyable activity held once a month, reacquaint with old friends or meet new ones," said Deana R. Turner, manager and funeral director at the Bauer-Hillis Funeral Homes. "We received great feedback when Bauer Funeral Home in Kittanning began the program in October 2009, and this program has since become a successful community outreach activity. Those who have joined us for past outings have experienced plays and concerts, informative presentations, tours of various locations in surrounding counties and many delicious meals." Bauer-Hillis Steps Ahead will kick-off the 2012 monthly activities in March, and the first event is designed to be a chocolate lover's dream. On Wednesday, March 28, 2012, bus transportation is arranged from Bauer-Hillis Funeral Home, 758 Main Street, Rimersburg to the Clarion County Career Center's Culinary Arts Department. Lunch will be served in the dining room by Chef Randy Shook and his students. Following lunch will be the feature event, "A Chocolate Affair", the visual preparation and tasting of mouth-watering chocolate samples. The class will also share a special presentation that includes humorous stories, fundamental characteristics and historical facts about chocolate. This will be an entertaining afternoon full of tasteful, decadent delights. The cost is $20, and reservations are necessary and due by March 16, 2012. The cost will be kept at a minimum for all the activities planned and some events will be completely sponsored by Bauer-Hillis Funeral Home. Attendance can be whenever an activity is of special interest or when it suits an individual's schedule. Monthly activities will be announced in the newspaper and on the website, www.bauerhillisfuneral.com. Anyone wanting more information or interested in joining Bauer-Hillis Steps Ahead planned events may call the Bauer-Hillis Funeral Home at 814-473-3080. Patricia Brothers, of Dairy Hollow Lane, Rimersburg, is the winner of a two-night stay in Hershey, PA, courtesy of Bauer-Hillis Funeral Home, Inc. This getaway is our February event for "Twelve Months of Giving Back", the funeral home's year-long celebration of the centennial service milestone for Bauer-Hillis Funeral Home in Rimersburg. "We wanted to thank the community for their support over the last 100 years, and we thought giving away a trip in honor of Valentine's Day would be the perfect gesture," said Deana R. Turner, manager and funeral director at Bauer-Hillis. "We are thrilled for Patricia and hope she has a wonderful time in Hershey." Patricia is the secretary for Heeter Lumber in Rimersburg and she can't wait to enjoy the trip with her husband, Chuck. "Twelve Months of Giving Back" will continue throughout 2012. To find out about our monthly events, visit watch the local newspapers or call 814-473-3080. The Bauer-Hillis Funeral Home will host a free Spring Grief and Remembrance Program entitled, "Living After a Loss: Surviving the First Year." This very special presentation will be held on Thursday, March 8, 2012 at 7 p.m. at the Bauer-Hillis Funeral Home, 102 Argyle Street in Petrolia. Jenna Rhodaberger, MSW, LSW, Bereavement Coordinator and Medical Social Worker of the VNA Hospice of Western Pennsylvania, will offer guidance on how to cope with grief and will help identify the normal feelings that are generally experienced during the first year and beyond. Deana R. Turner, manager of Bauer-Hillis Funeral Home, is pleased for the opportunity to offer this event to the community. "Bauer Family Funeral Homes has partnered with VNA Hospice and Palliative Care in the past to offer a holiday remembrance program at our Kittanning and Rimersburg locations. We are excited a program has been created for the Petrolia area and we hope it will be a comfort for those currently dealing with the loss of a loved one," she said. The public is encouraged to attend this special bereavement support program. Reservations are requested but not required and there is no admission fee. Light refreshments will be served following the program. Please contact the staff at Bauer-Hillis Funeral Home at 724-756-2710 to advise us the number of guests who will be attending. On Monday, January 30, 2012, Bauer-Hillis Funeral Home in Rimersburg was presented with proclamations honoring the funeral home's 100 years of service to the Rimersburg area. The proclamations were presented by State Representative, Donna Oberlander (R-Clarion/Armstrong) and Clarion County Commissioners Wayne Brosius, Butch Campbell and Greg Faller. "We are thrilled to be honored by Donna Oberlander and the Clarion County Commissioners," said Deana R. Turner, funeral director and manager of Bauer-Hillis Funeral Home. "Over the last century, this funeral home been a fixture in the community, and even through different owners the residents have learned they can trust us to help them through some of the hardest times in their lives. These proclamations are a special way to acknowledge this exciting centennial milestone." Oberlander, Brosius, Campbell and Faller gathered at the funeral home at 11:30 a.m. with other local dignitaries who wanted to show their support for this achievement. They were: Jeffery Miller, district judge; Jim McCullough, Lions Club president; Terry Shaffer, Clarion County coroner; Susan Barger, Rimersburg Chamber of Commerce secretary; Pat Stewart, Rimersburg Chamber of Commerce member; Terry Custer, president of Rimerbsurg American Legion Post 454; Larry Murray, president of the VFW; and Pastor Dan George, former district judge. "Receiving these proclamations from the Clarion County Commissioners and State Representative Donna Oberlander is the perfect way to start off this year and our celebration," said Turner. "We are thankful to serve this community that is truly appreciative of this funeral home's service over the last 100 years." Bauer-Hillis Funeral Home, Inc. announces the giveaway of a two-night stay in Hershey, PA.
"This trip is the February event for 'Twelve Months of Giving Back', our year-long celebration of the centennial service milestone for Bauer-Hillis Funeral Home in Rimersburg," said Deana R. Turner, manager and funeral director at Bauer-Hillis. "We wanted to show the community our appreciation of their support over the last 100 years, and what better way to do so than to provide area residents a well-deserved weekend romantic getaway or family retreat in celebration of Valentine's Day." The trip is from Friday, April 20, 2012 until Monday, April 22, 2012, and the room is a two-bedroom suite at the Suites at Hershey that sleeps eight and includes a full kitchen. "Within minutes are a number of attractions, including Hersheypark, Hershey's Chocolate World and Hershey Factory Outlet Stores," said Turner. "This variety of options promises something to enjoy for whoever wins this trip." Food and entertainment fees are not included in the giveaway and are the responsibility of the winner. A $50 gas card will be given to assist with travel. Also, trip dates are non-transferable. To enter, clip and complete the ad coupon that will run in the Wednesday, February 1, 2012 issue of the Leader Vindicator or visit Bauer-Hillis Funeral Home, 758 Main Street, Rimersburg, to pick up an entry form. Return the completed entry form in person to the funeral home between the hours of 9 a.m. and 4 p.m. from Monday, February 6, 2012 through Friday, February 10, 2012. No other entries will be accepted. Only one entry per person. The winner will be drawn on Wednesday, February 14, 2012 and will be notified by phone. Call Bauer-Hillis Funeral Home at 814-473-3080 for more information. On Thursday, January 26, 2012, the staff of Bauer-Hillis Funeral Home in Rimersburg treated members of the Rimersburg Senior Center to an ice cream social. The ice cream social is the first of many events planned for "Twelve Months of Giving Back", the campaign celebrating the 100 years the funeral home has served Rimersburg and surrounding communities. At the senior center, members were treated to a variety of ice cream flavors and toppings served by the staff and then settled in to have a good time socializing with each other. "As a side activity, we hosted a trivia contest," said Deana Turner, manager and funeral director at Bauer-Hillis Funeral Home. "Everyone had such a good time playing�it was the perfect side to the bowls of ice cream." The winners of the trivia contest, Bob Pancott and Judy Bashline, each received a box of chocolates and a $10 gift card to Dollar General. "I would like to thank Kelly Fair, director of the Rimersburg Senior Center, for allowing us to come out and serve everyone," said Turner. "We had a great time and can't wait to participate in future activities." January is not the only month the funeral home will be sponsoring an ice cream social�each month a local business or organization that has been instrumental to the funeral home's success throughout the last century will be surprised with the treat. Want to know February's recipient of the ice cream social? Keep watching our website, our Facebook page and local newspapers to see who is selected next�the announcement could come at any time! To view pictures from the ice cream social, visit our Facebook page: www.facebook.com/pages/Bauer-Family-Funeral-Homes/169734884825#!/pages/Bauer-Family-Funeral-Homes/169734884825?sk=wall&filter=1. Bauer-Hillis Funeral Home, Inc. proudly announces 100 years of service to Rimersburg and surrounding communities. In 1912, gas was 7 cents a gallon, a stamp was 2 cents and 855 residents called Rimersburg home. It was also the year Cember 'CB' Stewart opened the Stewart Funeral Home at the current location of Veteran's Memorial Park. "Funeral service has come a long way since Mr. Stewart first opened his doors to the residents of Rimersburg," said Deana R. Turner, funeral director and manager of Bauer-Hillis Funeral Home. "Owners of the funeral home throughout the last 100 years have also changed and include James D. "JD" Miller and Richard D. Hillis. Bauer Family Funeral Homes acquired the firm in 2010 and we are honored to serve this area," said Turner. "As a member of the Rimersburg community, we at Bauer-Hillis Funeral Home pride ourselves on taking our service outside our doors and into the region." To honor the centennial and say thank you to the area, Bauer-Hillis is announcing the "Twelve Months of Giving", a series of special events each month throughout the coming year planned to celebrate this milestone. Turner said the community service campaign is meant to show the area residents just how much the funeral home appreciates its continued support over the last century. "This year's centennial celebration will honor the people who made, and continue to make, all of these changes possible. Without the citizens of this area, the funeral home would have never succeeded�we only have them to thank." "Every month in 2012 we will sponsor an event to benefit the Rimersburg area, ranging from visits to individual organizations to fun family outings," said Turner. "Rather than focus on one day and a single project, we wanted to have a greater impact for the entire year. I can't think of a better way to mark our centennial than to give back to the community." The centennial will begin with a proclamation of service to the community from Pennsylvania State Representative, Donna Oberlander (R-Clarion/Armstrong) and other community officials, said Turner. "We are excited that she will be honoring the funeral home during this milestone year." The proclamation will take place Monday, January 30, 2012 at 11:30 AM at Bauer-Hillis Funeral Home, 758 Main Street, Rimersburg. The kick-off event in January will be an ice cream social at the Rimersburg Senior Center on Thursday, January 26, 2012 during the lunch hour. "This fun gathering will provide a nice treat for individuals involved with the senior center and show them how much they mean to the area." The ice cream social, however, will not be a one-time event. Each month, an area business or organization that has fostered the growth and development of the funeral home over the last century will be chosen to receive the treat. All events for the "Twelve Months of Giving" will be announced in advance and can also be previewed at the funeral home's website, www.bauerhillisfuneral.com. "We are pleased to give back to this community that has supported us for the past 100 years and promise to provide the exemplary level of service the Rimersburg area has been able to rely on for the next century to come," said Turner.